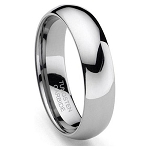 This timeless 5mm Classic style tungsten ring is sure to receive compliments. With a very clean, crisp look - this ring can be worn with anything and never look out of place! 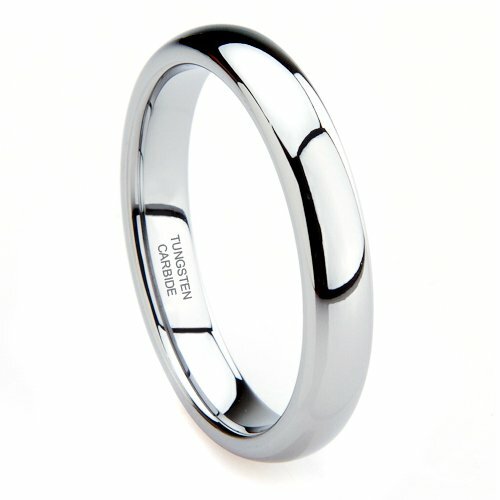 This Classic Tungsten ring also comes in a 2mm, 3mm, 6mm and 8mm. Alsocomes with a black velvet stylish ring box and FREE SHIPPING! Q: What are the two black lines on this ring? A: What you see is just a reflection. This ring is completely polished all the way around the ring, there are no lines or markings on this ring. Q: How do i no what size ring to get i went t a jewelry shop n they meaursed husbands finger was a size u but dont what that is on here please help? A: A little trick, is to order the same size as his shoe size. His shoe size is going to be close, if not the same to his ring size. You can always exchange the ring if it does not fit perfect (as long as it is not engraved) but that will give you the best estimate for his ring size. Much better value than the mall. They want 2-300 for similar rings. I just wish that they had different widths for more rings. Not quite as shiny as it appears on the pictures but I love the ring though....Nice fit and very comfortable....well worth the money! Bought this ring for $49.99 for my fiancé's wedding band. It is a beautiful gun-metal grey color and the perfect width! The gentleman at customer service was extremely helpful and I'm so happy with the ring. I was very pleased with my purchase. The initial ring was too large and I had to return it, but it wasn't a problem at all. Everything was replaced in a timely fashion. I would do business with them again. Love the ring,wasn't as shiny as it seemed in the picture. I actually like this one better than the gold one! I am very pleased with these rings. Bought this for my husband because he loves the look of a classy ring and this was exactly that. Classy and simple. It is very shiny and has a nice chrome look. We have looked at similar rings and the price is almost 4x as much. The only issue I've had is that the sizing was a little off for him, make sure you buy a half size bigger but I have an exchange for that soon. Would recommend this website. I loved all your collections. I have been shopping for the right one for a long time and managed to finally find a one to my liking. Will buy more as I have more family events. Great gift for family, siblings & friends too. I ordered this ring just prior to ordering a replacement for my white gold wedding band. 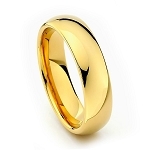 The tungsten ring looks so good, I am a little sorry I ordered the much more expensive ring. Tungsten Fashions exchanged the size for me after a week without any questions. The buying process is seamless and the rings are terrific. I viewed the same ring in my local jewelers for $350. I highly recommend Tungsten Fashions. Beautiful, simplistic and true to size fit. I love the smoothness of this ring and how it looks on my hand. No problem recommending this site to anyone that is looking into it. The shipping was very fast and the ring was well packaged. Keep up the good work!! I have ordered from you and have had excellent service and WONDERFUL rings. I love them, they are so comfortable. Your products are just amazing and I will keep ordering from you. Thank you for making such excellent rings,I will tell all my friends that are looking for wedding rings to go to your company. Thank you again for the excellent merchandise. My wife liked my 8mm ring so much she wanted one, so I suprise her with the 5mm version. Very nice product. I love the weight feels like I'm actually wearing something substancial. Very well made but ordered in a hurry for my son. Thought it was going to look like white gold or sterling. Will be returning it but may repurchase and try the yellow gold look. This ring is good. Fit is fine, look is nice, no issues. The quality is as good as the other 2 rings I already purchased from here. I am completely satisfied. They will last a life time.